As we have since July 2006, each Friday we’ll post a mixed bag of quick cigar news and other items of interest. We call ‘em Friday Samplers. Enjoy. 1) It was announced this week that Cuban cigar production fell 14% in 2010. The harvest wasn’t impacted by adverse growing conditions, but rather a reaction to the worldwide economic slowdown and the spread of smoking bans. Cuba, facing budget shortfalls, decreased the land devoted to tobacco cultivation by 30% last year. “There was a reduction in planting due to limitations in resources caused by the economic crisis,” local media reported. 2) As we wrote on June 11, New York Gov. David Paterson wanted to drastically increase the state’s tax on cigars to pay for a budget shortfall. This week he got his wish. Politicians in Albany passed a bill that jacks up the wholesale tax on cigars from 46% to 75%. The increased revenue will be used in part to pay for “tobacco cessation programs” that, if successful, will ironically decrease tax payments over time. 3) Inside the Industry: Along with price cuts, look for new packaging on EO 601 cigars (co-owner Erik Espinosa tells StogieGuys.com that he hopes the new look will attract attention so smokers will notice the lower prices). 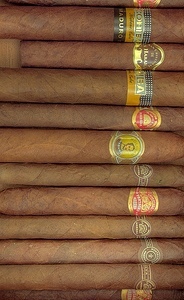 The 2011 ProCigar Festival will be held on February 6-11 in the Dominican Republic. 4) Around the Blogs: Keepers of the Flame torches a La Gloria Cubana Artesanos de Tabaqueros. Stogie Fresh fires up a Davidoff Maduro R. Stogie Review reviews a KA Kendall 7-20-4. Smoking Stogie smokes an Epernay Le Matin. Cigar Inspector lights up an Ambos Mundos. 5) Deal of the Week: Like Perdomo cigars? Haven’t tried them yet? Either way, this “Perdomo Power Sampler” is worth a look. With four Perdomo ESV ’91s, plus one of each of the five Perdomo Reserve lines, this deal offers plenty for the Perdomo newbie or veteran, all for under $40. Grab yours here.